This book is compiled from notes from my diary and extracts from letters written during my stay in Jerusalem in the summer of 1946, and during the whole war [War of Independence] period 1948 – 1949. It does not profess to be a comprehensive survey of the situation in Palestine and I have intentionally not dealt with the political, economic and spiritual problems which contributed to this war. I have only tried to give a few pictures of life as I experienced it in Jerusalem before, during and after the siege. 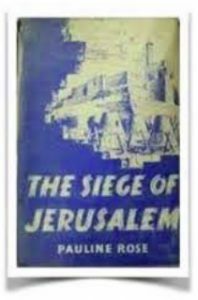 Click on each link in sequence below to hear Keren share Pauline’s personal and gripping account of The Siege of Jerusalem. This entry was posted in The Siege Of Jerusalem by Cindy Lou. Bookmark the permalink. Well I was reading from this very same book to my guests around my Shabbat Table last Friday.